Today a colleague and fine artist Ian came to look at my work. I really respect his judgment and felt relieved and reassured to have some constructive feedback from him. The most interesting aspect of my work for him were the digital drawings produced on a basic mobile phone app. The shapes in these he liked because they seemed to be informed by the colour rather than compositional concerns. I believe this is a result of the limited language available to work with via the app. He considered the large canvas paintings to be laboured and concerned too much with ‘design’. I agree with him on this point, they took several days to complete and lost the spontaneity am striving for as a connection to capturing fleeting atmospheric conditions. Ian thought that I should continue disregarding any sense of depth or perspective that could relate the work to representational concerns. I should concentrate on abstract composition, flatness of surface and the quality of the edges of forms ie the blurring and softness that has evolved. In the early 1950s, Noland began producing a number of series, each of which explores a range of shapes and color arrangements and remains committed to his staining method as a means of overcoming the tactility of the canvas support with the opticality of pure color. 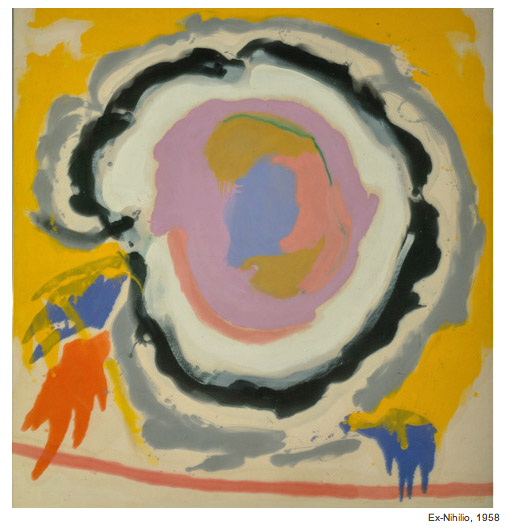 Like Frankenthaler and Louis, Noland experimented with thinned, acrylic-based paints, which made it nearly impossible to revise or modify colors after the paint had penetrated the (unprimed) surface. To stress the care needed to execute these works, he referred to them as “one-shot” paintings. I see the relationship to my own way of working , to have enough work for the final show I will have to produce large number of pieces accepting that only a select few will be good enough to exhibit. 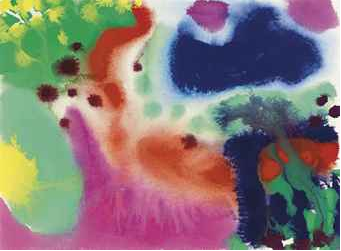 Another artist mentioned during out discussion and who I am deeply inspired by was Patrick Heron. This entry was posted in Inspiration, Research and tagged abstract, Abstract art, art, Atmosphere, Canvas, Color, Digital drawing, Drawing, fine art, Humber, ideas, Kenneth Noland, landscape, light, Paint, Patrick Heron, Visual Arts, weather. Bookmark the permalink.